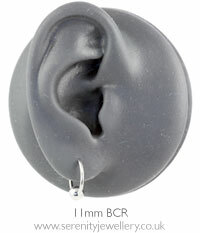 Hypoallergenic surgical steel BCR (ball closure ring/captive bead ring) with clip-in ball. 11mm (7/16") internal diameter titanium rings are closed with 5mm titanium clip-in balls. 8mm (5/16") rings are closed with 3mm or 4mm clip-in balls. Compatible with the appropriate size clip-in accessories. Due to the way they are put in BCRs are not recommended for children. I haven't been able to wear this yet as I have been unable to fit the ball in. I can do it when the earring is not in my ear but not otherwise. I think it just requires practice.. There was nothing wrong with the earring itself, just a standard BCR, but I found the 8mm ring was too small and tight for my ear. Amazing!! Fiddly to fit though! Always buy my jewellery from here & it's always great. This is no exception. The only problem I had was that it was for my tragus & I had to go to a piercer to have it changed as it's quite fiddly! Earrings perfect.Serenity were really helpful via email in helping make sure I got the right size.I'll definately be using them again. Love the design but the ball was difficult to put back on!